In case you haven’t noticed by now, I’ve added a new tab. Previously, I added pages to organize all of my movie-related posts and all of my posts dealing with religion and spirituality. “Humor/Social Commentary/Other” is my final “indexing” page, and includes links to posts that don’t fall into the other two categories. At some point, I may add a page featuring links to some of my favorite websites. But until then, we’re up to date. Thanks for reading, and I hope everyone had a great Thanksgiving! First of all, let me assure my readers that the film reviews will resume soon. I just wanted to touch on this time-sensitive topic as early as possible. Both peoples — that is, Christians and Jews — have known God’s faithfulness and care throughout the millennia, and the flames of the menorah and the Advent wreath alike call to mind the hope that comes from this faithful God — a hope carried through many turbulent centuries in the midst of turmoil, darkness, and uncertainty. I’ve discussed the focus of Advent already, if you recall. But what exactly is Hanukkah all about? Did I get your attention? Good — now I can clarify that I mean “hedonism” in the broadest sense of the search for happiness. 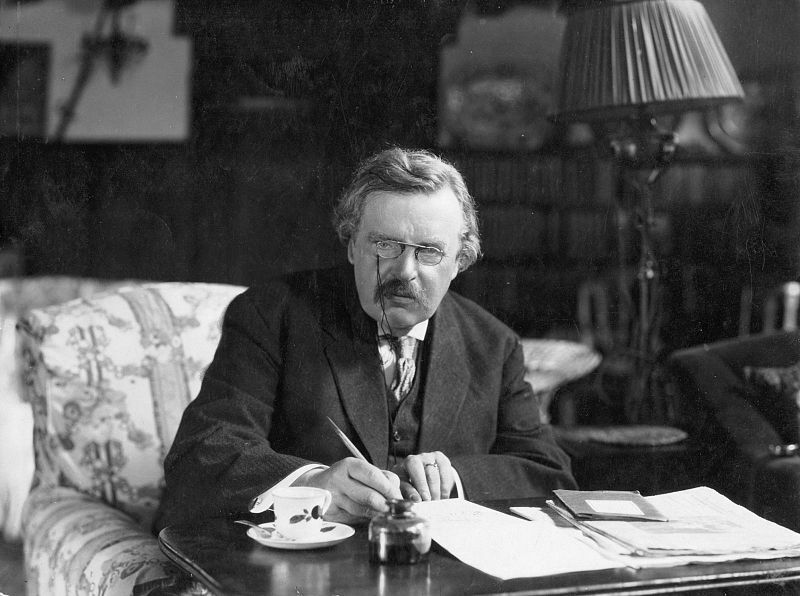 I am reminded of comments from the great English essayist G.K. Chesterton, who had a lot to say about the joy of a life of thanks-giving in his biography of St. Francis of Assisi. Basically, what he said was this: Most of us, to our own misery, go through life as creditors rather than as debtors. C. I’ve got to ceaselessly hound the world to give me what it owes me, or else I must be unhappy. We could probably stop right there. But let’s look at the alternative of living the life of a debtor — that is, someone who has been given much, and cannot possibly repay anyone or anything for it. Now, if this indebtedness is to a creature, then we could see this causing nervousness. But if it is to the Creator, Who needs nothing and to Whose happiness we, as creatures, could never add, then how could we live except in pure joy? To be a Christian is to be grateful — first and foremost for the gift of the Son of God and His vicarious sacrifice for our salvation, but also for all the gifts of God. Indeed, God Himself is pure gift. 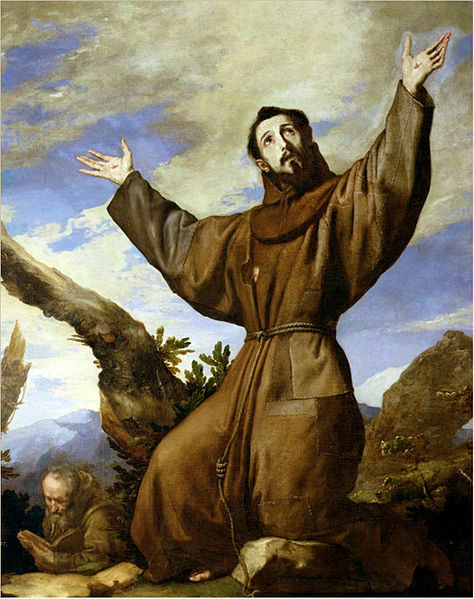 From all eternity, the Divine Life consists of the self-giving and generous interplay of Father, Son, and Holy Spirit. The Father, from all eternity, gives Himself away in love to the Son. The Son, from all eternity, gives Himself away to the Father in gratitude. The Holy Spirit, from all eternity, is this very Love between the Father and the Son. And God communicates this goodness to us through the gifts of life, creation, and providence. The more we realize our reasons for gratitude, the deeper our relationship with God can become; the deeper the relationship, the greater the spiritual blessings we receive, and the more obliged we are to show gratitude…and the joyful cycle continues. Happy Thanksgiving all. Take care! So we’ve established the Hunger Games as symbolic of the totalitarian regime that runs them (Panem) in that people are pitted against one another for survival within a controlled environment, or “small world,” and thereby kept unaware of the true enemy. But in both of the “Hunger Games” movies that have been released, we have protagonists who fight back by refusing to play the game by Panem’s rules. In the first film, “The Hunger Games,” you have Katniss Everdeen and Peeta Mellark feigning a romantic relationship, showing willingness to die rather than kill each other, and capturing the hearts of spectators. 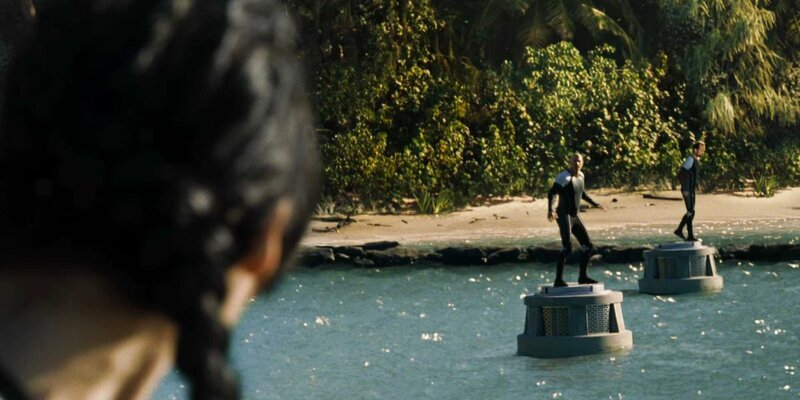 In “Catching Fire,” we see the effect of this unique, dual victory on the people. 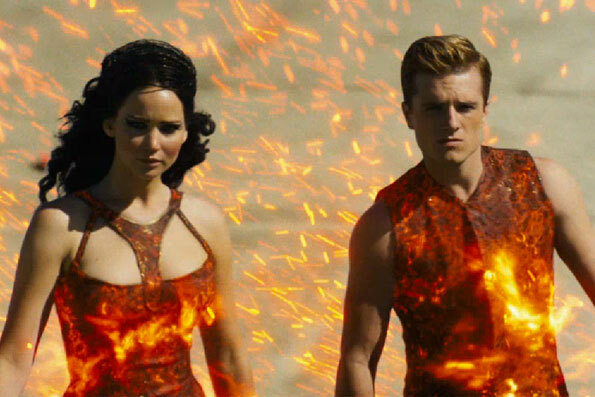 Katniss and Peeta become symbols of hope. They embolden the populace and, for that very reason, are perceived by President Snow and the Panem Capital as a threat. And what is the Capital’s response? Katniss, Peeta, and 22 others are put in an arena for the “Quarter Quell,” an event that occurs every 25 years and draws from the pool of past Hunger Games victors. 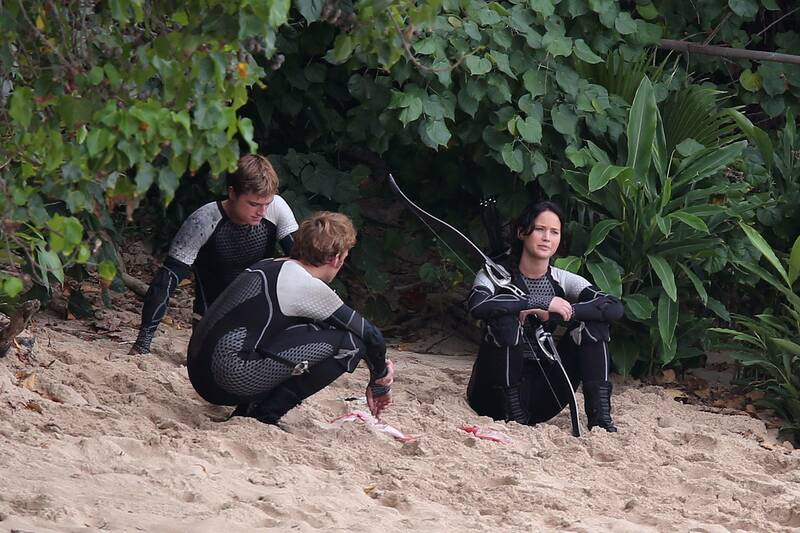 Once in the arena, several of the tributes strive to work together rather than against one another, recognizing that they share a common enemy. But the bond they form is pretty vague, and they are operating within the enclosed “world” of the game. 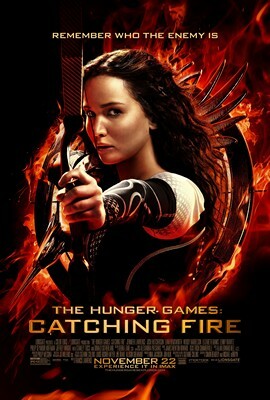 But this time, Katniss takes her subversion even further by serving as a Christ-figure. 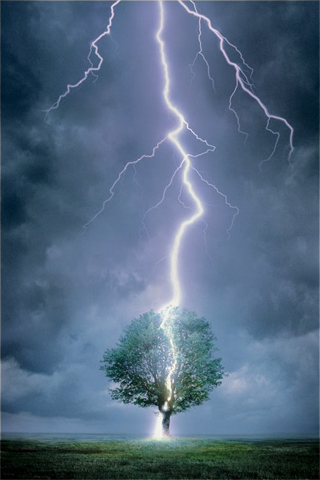 This she does at the “lightning tree,” which is always struck by an artificially contrived lightning bolt at midnight (if I remember correctly). At a decisive moment, she stands by the tree, bow aimed toward the sky, and then lets an arrow fly the moment lightning strikes. In so doing, she redirects the lightning bolt toward the force field that holds the arena together. This brings down the metallic ceiling of this contrived, artificial environment and disables all screens by which the Panem employees who control the games can see what’s going on. We could look at this as a symbolic gesture: Katniss is bringing down not only the Quarter Quell arena, but also — and by extension — the false “world” created by the Capital, thereby inviting the people to see that their fundamental freedom is not, in fact, in Panem’s possession. Hence, the rebellion is quickened. She also shows her fellow tributes that victory cannot be achieved by playing the “game” they have been put into, even if they play through cooperation rather than competition. If they are to achieve true victory, then there’s no way around it…they have to bring the game down. We’ll explore the spiritual significance of this scenario in part three. Thanks for reading. Images obtained through a Google image search. Francis Lawrence’s adaptation of Suzanne Collins’ “Catching Fire” is clearly dominating the box office — and with good reason. It’s a great film, filled with emotion, depth, artistry, and impressive visuals. Another kingdom (silver) shall take your place, inferior to yours (gold), then a third kingdom, of bronze, which shall rule over the whole earth. There shall be a fourth kingdom, strong as iron; it shall break in pieces and subdue all these others (…) In the lifetime of those kings the God of heaven will set up a kingdom that shall never be destroyed or delivered up to another people; rather, it shall break in pieces all these kingdoms and put an end to them, and it shall stand forever. That is the meaning of the stone you saw hewn from the mountain without a hand being put to it, which broke in pieces the tile, iron, bronze, silver, and gold. The great God has revealed to the king what shall be in the future; this is exactly what you dreamed, and its meaning is sure. Panem, the oppressive government in the post-apocalyptic “Hunger Games” series, is no exception here. 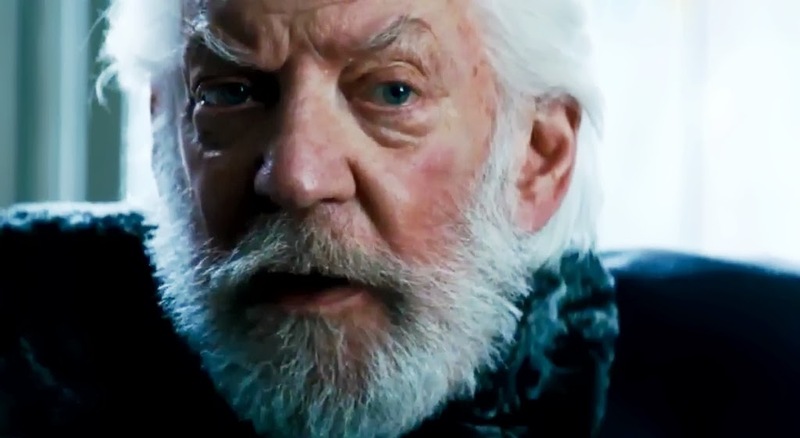 As President Snow (Donal Sutherland) basically admits in “Catching Fire,” it is a fragile system that must assert itself desperately through the use of force. How do such governments manage to hide their vulnerability and keep people in check? Well, an excellent tool — one used very effectively in the “Hunger Games” series — is to keep the masses trapped within a superficially tiny world, one small enough that a dictatorship could exercise complete authority in it. What they must do, in other words, is keep people blind to the transcendent, to the larger world and/or larger reality. The Hunger Games are wonderfully symbolic of this whole situation. Think about it: The Panem Capital takes a group of people — “tributes” — puts them into an artificial and controlled environment, deprives them of necessities, makes them have to fight for survival every minute, and has them compete against one another for this survival. What then happens is that they get so busy fighting each other that they lose sight of who the real enemy is. But, of course, you have the hero figures Katniss Everdeen (Jennifer Lawrence) and Peeta Mellark (Josh Hutcherson) who strive to stand against the status quo. I’ll get more into this in part two. “Catching Fire” poster from Wikipedia; remaining images obtained through a Google image search. Just saw this movie a couple nights ago — I regret not having heard of it until recently. I won’t launch into a full-scale review or commentary, but I want to say a quick word about I.S. 318. While the school’s thriving chess team is, in many ways, the main focus of this movie, chess is not the only thing I.S. 318 has to offer. They also offer their students a variety of great programs in the arts, music, technology, etc…and you get a nice snapshot of these at the beginning of the film. Plus, they appear to have a very active student government; and whenever their school’s programs are threatened with budget cuts, the students work hard to raise necessary funds — and with remarkable success. The whole thing reminded me very much of the the story of Eden and God’s original vision for humanity. When we hear “Garden of Eden,” we typically think of God’s prohibition: “Do not eat from that tree.” But we tend to become so focused on the prohibition that we forget about the far greater permission given in the very same story. God gave to our first parents the right and the mandate to cultivate the Garden. Many of the Early Christian Fathers saw in this His endorsement of the human project — of human flourishing in the arts, sciences, politics, and all of those very exciting things that show forth the dignity of God’s children. When we talk about educating “the whole child,” we are getting at something much deeper than we think. Would the world be made magically perfect if a school like Brooklyn’s I.S. 318 was replicated everywhere? By no means…but I hope you are presupposing my acknowledgement of this in reading this article. But I do think that in a school such as this, we can see something of the Edenic ideal in action. One more thing: I was very impressed with the fact that the students in this documentary didn’t whine about their school’s budget problems or sit around waiting for the City to give them more money. They took ownership for their school, and for the programs that meant so much to them. That’s another aspect of God’s vision for humanity that we need to recover: Personal responsibility…agency…free will.